YouTube CEO Susan Wojcicki revealed earlier in 2018, that over 1.8 billion people use the service every month. The number could be higher considering the statistics are only for users who are logged in. If you’re anything like me, you are probably subscribed to many channels and your attention is divided. For a channel owner, this means a good number of subscribers may be on other channels when you go live. Wouldn’t it be great if you could get their attention? In this tutorial, we are going to learn how to use Twilio to send an SMS to a list of subscribers when your YouTube channel goes live. On your preferred location, create a folder and name it. I have named mine "Twilio-YouTube". Once that’s done, open the folder using your preferred code editor. We will need two dependencies for this project. The Twilio SDK for PHP, which makes it easy to interact with the Twilio API from our PHP application and PHP Dotenv which helps us load environment variables from the .env file. More about the .env file to follow. Run this command to install the dependencies. Sensitive credentials shouldn’t be stored in source code. Instead, we should store information such as API keys and database passwords in a place inaccessible by the web browser. Using our previously installed dependency vlucas/phpdotenv, we will be able to retrieve the environment variables from a .env file. TWILIO_SID="INSERT YOUR TWILIO SID HERE"
TWILIO_TOKEN="INSERT YOUR TWILIO TOKEN HERE"
TWILIO_NUMBER="INSERT YOUR TWILIO NUMBER IN E.164 FORMAT"
NOTE: You can locate your channel ID by following the instructions provided here. From the Google Project you created, click on the “Credentials” tab. Copy your API key and paste it as the value of the environment variable we just created. Your Twilio token and SID are found on your dashboard. Please see below. Lastly, in the root directory, create a new file and name it sendMessage.php. All functionality goes into this file. channelId: Indicates that the API response should only contain resources created by the channel. type: restricts a search query to only retrieve a particular resource. In our case, video. eventType: restricts a search to broadcast events. In our code, we will check the totalResults value. For the purpose of this tutorial, we will assume that we only have one channel. Therefore the totalResults can only be 1 or 0. If that value is 0, we know that we don’t have a live channel. If the value is 1, we will go ahead and check the video ID. Because we will be running a cron job every minute, we don’t want to send more than one message for the same broadcast. We will compare the video ID with what we have in our database. If the video ID exists, then no message is sent. Otherwise, we send an SMS. To save the videoId when the channel goes live. To retrieve the last stored videoId and compare with the current videoId before sending an SMS. This will help us ensure that we are not sending numerous messages for the same broadcast. To retrieve the list of subscribers. Since we want to keep our code DRY (Don’t Repeat Yourself), we will place this logic in a function and call it when necessary. When you install PostgreSQL, the installer installs useful tools for working with the database server. One of those tools is the command line tool called psql. You will be prompted to enter the required information such as server, database, port, username and password. If you press enter, psql will use the default values inside the square brackets. Let’s go ahead and create our database. This will create a new database called Twilio. You can name yours differently if you wish. 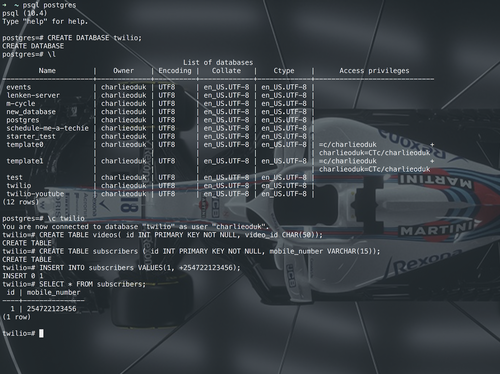 If you enter the command postgres=# \l, you should now see your new database. Next let's connect to our new database. Great! Now that we are connected to the database, we can create some tables using SQL statements. We are going to create two tables. One called subscribers and the other videos. For the videos table, we will have three columns, id, video_id and created_at. For subscribers we will have id and mobile_number. In order to test out our code later, we need at least one subscriber in our database. Let us add our Twilio verified number. We can confirm that the number was successfully stored by entering the following query. We are making an API call to the YouTube search resource. What we get back is a JSON string. Using json_decode we convert the string to an object, making it possible to get the data that we need out of it. The first piece of data we get is the “channel status”. We are using a ternary operator to check if the totalResults value is greater than 0. If it is greater than 0 then we get a boolean value of true, meaning the channel is live. Otherwise, the value is false. 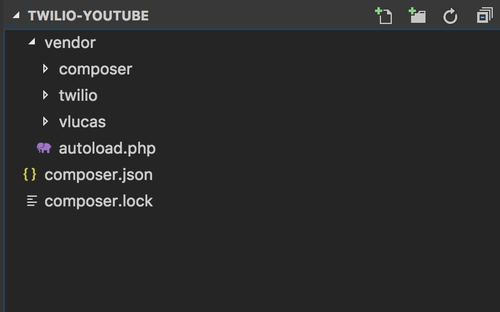 The second piece of data we get from the JSON object is the video ID. $previousVideoId is retrieved by calling a different function. We will have a look at that function next. Here we’re querying the database for the last entered/saved video ID. The result is returned to the function checkIfChannelIsLive() from which it is called. Let’s have a look at these functions. The Twilio helper we installed as a dependency makes it very easy to send an SMS. Since we have saved our subscribers in the database, we will fetch the numbers and have them stored in an array. Twilio caps message sending at one SMS per second, so we will loop through the array and send an SMS for each subscriber. If you have a large number of subscribers, you may consider using a messaging service to expedite the process. For this tutorial, because I am using a trial account we can only send messages to verified numbers. Therefore in the database I only have one number. The same logic however works whether we have one or 1000 numbers. "body" => "Hey! the channel is live!" In the code snippet above, we have two functions that fetch all the subscribers saved in the database and saves them in an array so that we can loop through and send messages. We use the Twilio client to send the messages. The last function we have saves the current video ID. It is this ID that will be fetched from the database the next time this process starts all over again. We are saving two things in the database. The video ID and the date and time the video ID was saved. Lastly, at the bottom of the file we are calling the checkIfChannelLive() function. This is where the functionality of our code begins. All other functions we have declared will be called as a result of this function being called. In your code please make sure you enter the channel ID of a channel that is currently live. From the console let us run the PHP file with this command. Did you receive this message? Let’s make sure we cannot receive two messages for the same live broadcast. Run the command again. Did you receive a message this time? If you didn’t, then everything worked correctly! Congratulations! You have just sent an SMS when a YouTube channel goes live! Now that we have confirmed that our code works, we need to create a cron job that runs our code in intervals. By default the YouTube data API allows you a quota of 1 million units per day. For more information please check out the documentation. We are going to have a cron job that runs every minute. In the crontab we will set the interval. What we just set above means our code will run every minute. We did it! Now that you have completed this tutorial, you can add a form on your website to sign up your subscribers. If you’d like to check out the complete code, please do so on Github.